The 2xCD edition of the album is expected on July 13. 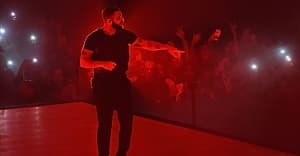 The physical release of Drake's Scorpion will be available from July 13, Pitchfork reports. An Amazon listing for a 2xCD version of the album was posted online yesterday. At the time of writing there are no details of a vinyl release for the 25-track album. The FADER has reached out for more information. Scorpion was released digitally on Friday, June 29. It has already broken streaming records on both Apple Music and Spotify. The album includes the singles "Gods Plan," "Nice For What," and "I'm Upset." Samples on the record come from artists including Michael Jackson and Mariah Carey, as well as a line of dialogue from Donald Glover's Atlanta.